The Grammar School at Leeds (GSAL) is innovative in its work providing opportunities for looked after children. Working with Labour-led Leeds City Council, the GSAL helps to support foster carers and their families through practical assistance, activities and bursaries in an expression of theirs and the council’s commitment to putting the needs of children and young people first. Enhance the experience of looked after children and foster carers by providing memorable activities for many and for a few providing life changing opportunities through the bursary scheme. Support Leeds City Council work by enabling their activities for looked after children. A looked after child is a child or young person who, up to their 18th birthday, is either accommodated by or in the care of the local authority. The statistics related to the over one thousand children and young people in care across Leeds are very stark: only 14% of young people who have experienced care achieve 5 A*-C grades at GCSE compared to the national figure of 57% and only 6% of care leavers go to university. Furthermore, between 2004-2014 there was a 50% increase in the number of young people leaving care at 16, making it a significant issue in need of addressing. In order to help those in care Leeds City Council, through their ‘Child Friendly Leeds’ initiative inspired in 2013 by UNICEF’S Child Friendly Cities campaign, focus on providing comprehensive assistance to foster carers and their families, recognising this as vital for placements to be successful. Therefore, while The Grammar School at Leeds has an extensive school outreach programme, its cross-curricular activities reaching approximately 2,000 pupils a year from across Leeds and West and North Yorkshire, the school decided it wanted to do more to help some of society’s most vulnerable young people. The Grammar School at Leeds has helped Leeds City Council support young people and their carers in a number of effective ways: the school offers practical assistance by making their rooms available for staff meetings and away days at no cost, freeing up the council’s resources to support the children. The space and facilities are further provided for free for an Independent Visitors Day so that those who provide valuable support for looked after children can spend a day with their mentees doing a range of sports and fun activities in a safe and secure environment. 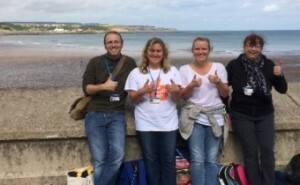 Alongside this, the GSAL provides transport at a low cost to enable looked after children take part in different activities, such as trips to the seaside. The Grammar School at Leeds also runs a number of fun enrichment activities for over 100 foster carers and their families. This has included enabling 50 children to visit a comedy workshop at Harrogate Theatre and see the author Julian Clary as part of the Ilkley Literature Festival, providing them with a memorable and enjoyable experience. The lives of individual young people in care is also transformed through the school’s bursary scheme. Typically, 200 children receive some form of financial support to attend the Grammar School at Leeds including children who are in care and children whose parents are foster carers. The school’s Director of External Relations works closely with the Head of the Virtual School, an organisation responsible for the educational outcomes of over a thousand looked after children, to improve how they can identify pupils who could benefit from attending the school. A recent alumna who received a bursary and was in long-term foster care is currently studying languages at a Russell Group University. The GSAL are planning to extend their bursary scheme and so increase the number of people whose life chances are transformed.